Andrea and Tim met at University in Aberystwyth and Tim romantically proposed to Andrea at the top of a waterfall while they were on a volunteer project in Uganda. Their wedding was held in St Mary’s Church, Kington where Andrea’s brother Rev. Matthew Tarling performed the wedding ceremony. Andrea wanted an understated headdress to complement her bridal gown. 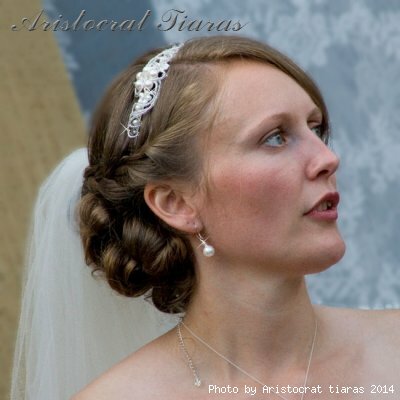 Aristocrat Tiaras designed the Princess Laura headband, the first in our new range of Swarovski crystal bridal headbands, especially for Andrea’s wedding. To fully enhance the effect, the bride also wore Princess Roza earrings and Princess Roza necklace also from the Aristocrat Tiaras Swarovski range. Andrea’s headdress sparkled in the sun as she entered the chuch on a beautiful Saturday afternoon and helped her look stunning throughout the ceremony. The lighting in the Lyde Court, Hereford, reception venue amplified the sparkle of the headdress as Andrea and Tim began their married life. The Swarovski sparkles added to the magic as the couple danced their first waltz in the evening.